Starting a bathroom remodel project can be daunting. That’s why you can rely on the expertise of our team at ProSource® of Pompano to ease the stress. Your dedicated account manager will provide guidance, and our private showroom will serve up design inspiration and wholesale products, which puts an overwhelming project into perspective. We act as your partner, ensuring the entire process is less stressful. It’s why ProSource is the source for bathroom remodeling. 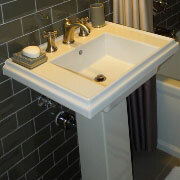 The sink is often a focal point of the bathroom project. It’s out in the open and used frequently. Sinks come in many types—such as pedestal or vessel, shapes—such as oval or square, and material—such as fireclay or marble. Connecting with the sink perfectly is the faucet. You can’t have one without the other in a bathroom project. 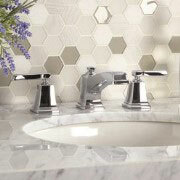 Faucets can range from traditional hot and cold knobs to beautiful handles with water spouts that surprise everyone. Showers are a wonderful place of serenity, even if it’s just for the five minutes needed to wash away the daily grime. Updating the shower can be one of the favorite parts to remodeling because it’s easy to see the difference. Look to ProSource for shower bases, doors, shower heads and handles, and more. 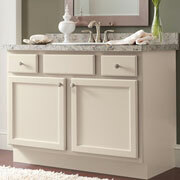 A bathroom vanity is a stand-out piece in the bathroom. Not only can it be a unique piece of stylish décor, but it can serve as much-needed storage space. A new bathtub chosen for a bathroom remodel can transform the experience of using it. 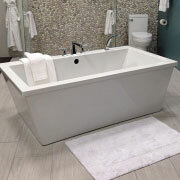 ProSource has tubs that can fit in even the smallest of spaces, and we have tubs for a luxurious and spacious jet tub escape. 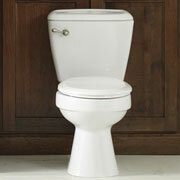 The toilet can be overlooked as a decision that’s not as important during bathroom remodel projects. However, toilets today are not all the same. ProSource can help filter through your choices by flush ratings, bowl size, and other flush mechanisms and features.